[134 Pages Report] The global enterprise asset management market is expected to grow from USD 3.44 billion in 2017 to USD 6.05 billion by 2022, at a Compound Annual Growth Rate (CAGR) of 11.9% during the forecast period. Major factors, such as increased asset of life aging infrastructure, reduced maintenance and procurement costs, increased tracking ability of assets in an organization, and improved return on assets, are driving the growth of the market. enterprise asset management software and services are used by various industry verticals such as government, oil and gas, manufacturing, healthcare, transportation and logistics, energy and utilities, and others, including the retail, and metal and mining. The base year considered for the study is 2016, and the forecast has been provided for the period between 2017 and 2022. Assets are required for industries, such as oil and gas, energy and utilities, and manufacturing. Assets are purchased or built with the notion of long-term usability. These asset-intensive industries require fixed, costly, and bulky assets whose designs cannot be changed frequently. In order to make sure that these assets are properly maintained, such industries deploy enterprise asset management solutions to make the most of their existing facilities, along with providing asset safety, reliability, and enhanced productivity. In the coming 5 years, new infrastructure and construction projects in the oil and gas industry, and new infrastructure projects across the globe are expected to drive the demand for enterprise asset management solutions. These projects require solutions, such as asset management, inventory tracking, and improved work efficiency. In addition, the need to maintain an aging infrastructure is making the role of maintenance in organizations crucial. Regions such as APAC, MEA, and Latin America are expected to exhibit the highest demand for enterprise asset management solutions for infrastructure. In addition, other industries, such as oil and gas, healthcare, energy and utilities, and transportation and logistics are expected to generate a substantial demand for asset lifecycle management. To address the problem of aging infrastructure, government agencies are focusing on enterprise asset management market solutions to make smarter decisions around operations management, maintenance and planning, and risk reduction. The enterprise asset management market ecosystem comprises the service and solution providers, such as ABB Ltd. (Switzerland), CGI Group Inc. (US), Dude Solutions, Inc. (US), eMaint (US), International Business Machines (IBM) Corporation (US), IFS AB (Sweden), Infor (US) Oracle Corporation (US), Ramco Systems (India), SAP SE (Germany), Schneider Electric SA (France), and Vesta Partners, LLC (US). These Enterprise Asset Management Software Vendors are rated and listed by us on the basis of product quality, reliability, and their business strategy. Please visit 360Quadrants to see the vendor listing of Enterprise Asset Management Software. In April 2017, ABB and IBM collaborated to enhance and upgrade ABB’s existing asset and analytics implementation with IBM Watson’s cognitive abilities and ABB Agility. In May 2016, CGI Group collaborated with Sears Canada to assist retail clients in enhancing and re-engineering their technology platforms. 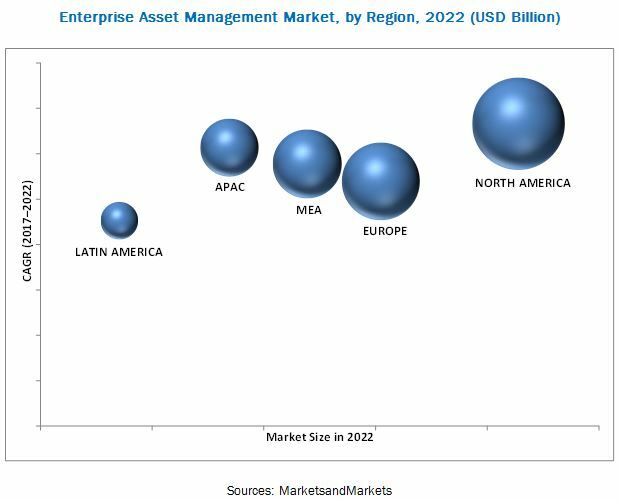 The Enterprise Asset Management Market is expected to grow from USD 3.44 billion in 2017 to USD 6.05 billion by 2022, at a Compound Annual Growth Rate (CAGR) of 11.9% during the forecast period. Several factors, such as the increased asset of life aging infrastructure, reduced maintenance and procurement costs, increased tracking ability of assets in an organization, and improved return on assets, are responsible for the growth of the market. Industries such as the government, oil and gas, manufacturing, healthcare, transportation and logistics, energy and utilities, and others, including the retail, and metal and mining have boosted the growth of the market. The enterprise asset management market is segmented by component (software and services), organization size, deployment type, industry, and region. The service component is expected to grow at the highest CAGR during the forecast period, because services help organizations in easily deploying the software on their premises or on cloud. The cloud deployment type is expected to grow at the highest CAGR during the forecast period. Cloud-based services are provided directly through the cloud-deployed network connectivity. They help in reducing the overall costs, while also providing highly flexible and scalable access to solutions. Companies are deploying solutions on-cloud to improve the centralization, mobility, collaboration of data, and reduction of data loss during the transit. Security remains to be a critical issue, which restricts its adoption; however, this issue is gradually being eradicated through rigorous security tests, conducted to the highest standards by third parties. Due to these advantages, most vendors are switching from on-premises deployment type to the Software as a Service (SaaS)-based software. The Small and Medium-Sized Enterprises (SMEs) segment is expected to grow at the highest CAGR in the enterprise asset management market during the forecast period. Organizations with an employee strength between 100 and 1,000 are categorized under SMEs. SMEs are rapidly adopting the enterprise asset management software due to the need for domain-specific technical personnel and skilled workforce. Small organizations are not very receptive to the implementation of solutions, but the increasing competition for these solutions has prompted SMEs to invest in this business software and adopt the go-to-market strategies and make effective decisions for their business growth. Implementing this software can help SMEs enhance operational efficiencies and develop asset usage by building a strong standard base. enterprise asset management is likely to help SMEs administer assets efficiently across the facility by improving the deployment and extending the asset life. Even though the demand for solutions in SMEs is low, the need for such software solutions is expected to increase as the SMEs grow. The various public assets of municipal authorities and government need to be managed proficiently for regular functioning of the society. The public assets include manholes, meters, buildings, facilities, equipment, vehicles, railway tracks, signals, signs, yards, and bridges. In the government industry, helps in work management, asset valuation, risk management, preventive maintenance, and condition analysis. EAM plays a key role in the government industry, as this industry is estimated to account for the maximum share in the enterprise asset management market in 2017. Projects from governments, municipal authorities, and utilities need huge resource planning and asset management to deliver high-quality public asset management capabilities. Major enterprise asset management players, such as IBM, Oracle, and Infor offer solutions to meet the needs of state and local governments to successfully address public safety, ensure regulatory compliance, and enable optimum utilization of resources. The oil and gas industry is one of the asset-intensive industry that demands huge implementation of enterprise asset management solutions to improve the productivity and efficiency of its critical assets. Upstream drilling, downstream production, refining, and midstream distribution companies have a dire need to manage their critical assets to avoid equipment failures. Hence, to operate efficiently, substantial infrastructures are required throughout the oil and gas supply chain, with fewer downtimes. enterprise asset management facilitates integrated asset management, which helps organizations to conduct track inspection and testing, proactively maintain oil and gas plants, minimize the cost of operations, and reduce downtime. It also helps organizations meet the regulatory compliance, such as age of infrastructure, and reduce security and safety risks. For transportation and logistics industry, movement of goods and freight is highly important. enterprise asset management solutions for the transportation and logistics industry provide asset management best practices to manage and maintain moving and linear assets, such as buses, railways, aircraft, railway tracks, and roadways. Thus, these practices help in taking strategic decisions for asset performance, enhancing asset lifecycle, and maintaining public transit infrastructure for transportation and logistics authorities. The enterprise asset management market in this industry is expected to witness a significant growth in the coming years. enterprise asset management solutions also provide fleet management capabilities, along with cost optimization and improved ROA. 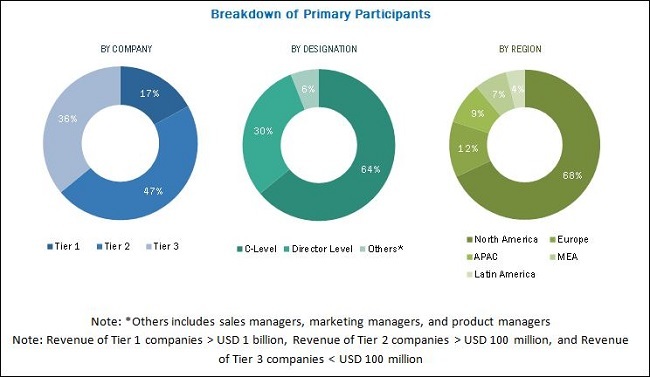 The global enterprise asset management market has been segmented on the basis of regions into North America, Europe, Asia Pacific (APAC), Middle East and Africa (MEA), and Latin America to provide a region-specific analysis in the report. North America is expected to have the largest market share and expected to dominate the market from 2017 to 2022. This is because, this region is quick in adopting new technologies, such as Bring Your Own Device (BYOD) and cloud platform, for which, companies are willingly investing to serve in the North American region. The major vendors that offer EAM across the globe are ABB Ltd. (Switzerland), CGI Group Inc. (US), Dude Solutions, Inc. (US), eMaint (US), International Business Machines (IBM) Corporation (US), IFS AB (Sweden), Infor (US) Oracle Corporation (US), Ramco Systems (India), SAP SE (Germany), Schneider Electric SA (France), and Vesta Partners, LLC (US). These vendors have adopted different types of organic and inorganic growth strategies, such as new product launches, partnerships and collaborations, and mergers and acquisitions, to expand their offerings in the enterprise asset management market. *Details on Overview, Product Offering Scorecard, Business Strategy Scorecard, Recent Developments Might Not Be Captured in Case of Unlisted Companies.